Like most visitors to Estonia, we arrived in Tallinn via the two hour ferry ride from Helsinki. It was the very last day of our trip to Finland and while I had tried to talk Tim into ferrying over to Estonia for weeks leading up to our trip, he didn’t think we had time. We met Chi Chi from Smart Travel Estonia on our familiarization trip around Finland and I think it took precisely two hours before we were planning to meet Chi Chi for a tour of Tallinn on our last day. Chi Chi was at the port to meet us as we arrived on the ferry and we were off on a walking tour of the city. We weaved a bit through some of the newer buildings and Chi Chi was a wealth of interesting information. As the tram rumbled along the street behind us, she told us that public tram system dates back to 1888 and original cars are still used. Pausing before entering the Old Town through the Viru Gate and getting our first real glimpse of the fairytale like Medieval town, we learned that the gate was the outside part of a complex gate system. In the old days, the gates were closed promptly at 9pm and anyone caught wandering around without good reason was sent to jail. As we emerged into the vast and practically empty Town Hall Square, we could imagine the festivals and Christmas Markets Chi Chi described take place here. She pointed out the best little bookshop to visit and the Town Hall Pharmacy, the oldest continuously running pharmacy in Europe. Even though the pharmacy sold all sorts of potions like powdered unicorn horn, its best seller was marzipan. Of course the start of the Town Hall Square is Tallinn’s Town Hall. Built between 1402 – 1404, it is the best preserved Town Hall in Northern Europe! In summer from May – September, you can even climb the 115 steps up to the belfry for what we hear are incredible views over the city. St. Nicholas Church, built around 1230, originally doubled as a fortress before the town walls were built. It survived looting during the Reformation in 1523 but wasn’t so lucky when it was severely damaged by bombing in World World II. The church was restored in the ’80s and today serves as a museum of religious art. Part of what gives Tallinn its fairytale charm is the well preserved walls and towers surrounding the city. We wound our way up along them toward the onion-domed St. Alexander Nevsky Cathedral. Perched atop Toompea Hill, the spectacular structure is Estonia’s main Russian Orthodox cathedral. No photos are allowed inside, but it is richly decorated with mosaics and statues and well worth a visit! We followed Chi Chi through practically deserted streets that would emerge into hidden courtyards where merchants were selling jewelry, handicrafts, and even wine. She was on a mission to lead us to a cafe loved by the locals for what Chi Chi claimed is the best chocolate cake. Indeed, warming up with a pot of loose leaf roobios tea and a slice of the chocolate cake was a divine break from touring the town. Chi Chi soon had to get back to work and she wound us down from the Toompea Hill through beautiful little streets. She had one last stop to show us before we parted ways, another tiny cafe tucked right into the top of the Town Wall. We learned so much about Tallinn and discovered spots we never would have had it not been for Chi Chi giving us such a great tour. Take the Tallink MS Superstar ferry to reach Tallinn from Helsinki in just 2 hours. Book the breakfast buffet for €10 per person. Smart Travel Estonia offers several tours of Tallinn, including the Old Town Tour, similar to the personalized tour Chi Chi gave us. This is a UNES CO World Heritage Site. For more info click here. We’re moving to Latvia next year and Tallinn is at the top of the list for regional travel. Can’t wait!!! Oh wow, Heather! What made you decide to move to Latvia? A job opportunity presented itself and we jumped on it. After living in China for so long, we were excited by the possibility of exploring a totally different part of the world! That’s fantastic! It will definitely be quite the change from China! Looks beautiful. You don’t hear much about Estonia. Definitely beautiful, Laurel! Even more interesting, we learned that Estonia has a lot of great hiking trails and eco-tourism outside of Tallinn. So we definitely want to go back to explore more of the country! Thanks, Amanda! We were very pleasantly surprised by Estonia and having Chi Chi as our guide was definitely key to us having a great visit. I have read the post on traveling on a budget in Tallinn, and you’re really making me want to go there in the near future. It looks so beautiful! Tallinn wasn’t at all expensive. It’s still off a lot of tourists radars and things are pretty cheap. A lot of people even live there and commute to Helsinki for work because Finland is so much more expensive. 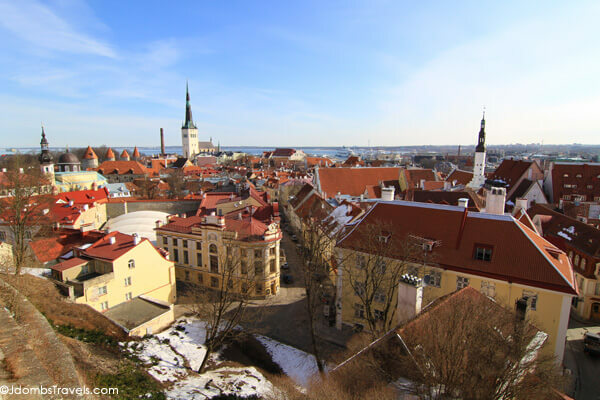 We had such a great time in Tallinn – so beautiful and so much to do! We definitely need to go back and spend more time that just a day trip there! Beautiful place! The pharmacy is onto a winner! I wonder why they started selling marzipan in the first place! Tallinn was definitely beautiful! Such a stark contrast to Helsinki just across the sea. Helsinki is more modern so I wasn’t sure what to expect with Tallinn. I’ve heard great things about Estonia, definitely somewhere I’d like to visit one of these days. Andy had a coworker from Tallinn, which just makes me even more interested! Oh, I bet he can give you some great tips for visiting Tallinn! I love following the advice of locals. Tallinn is one of my favorite city of the Europe. Very nice place, good cuisine etc., and, how you have written in one of your blog posts, the wool things… wonderful. We got some very nice woolen goods and had a wonderful, albeit short, visit. Definitely a place we’d like to go back to!